Bobby Thanepohn (left) and Mac McDonald are UGA certified beekeepers. Did you know that bears don't raid beehives for the honey? I didn't either. It turns out, bears are looking to consume the bees' larvae, which are good sources of protein. The honey is merely a sweet byproduct of their foraging. That’s what I get for basing my knowledge of bees and bears on Winnie the Pooh. 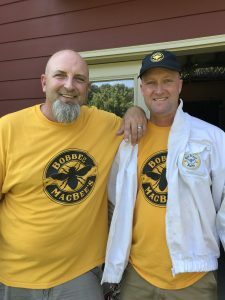 On the other hand, Bobby Thanepohn and Ryan McDonald (aka Mac) of Cherokee County have a wealth of knowledge when it comes to honeybees. They are apiarists, a fancy word for beekeepers. Both are University of Georgia certified beekeepers, and members of the Georgia Beekeepers Association and the Cherokee and Forsyth Beekeepers Club. The two have been friends since 2003, and enjoy hunting and riding motorcycles together. While sitting around a campfire on a hunting trip, the conversation revealed that each had started keeping bees. Since neither one likes to do anything halfway, they went all in, and soon realized they were about to have a whole lot of honey. During my visit to their hives, Bobby and Mac made sure I learned a few things about keeping bees. I now feel smarter than even the most average of bears. A mosaic of colors is created from the various pollens the honey bees gather. Photo courtesy of Bobbee MacBee’s. • Honeybees will fly up to 3 miles from the hive, or a 28-square-mile radius, in search of good nectar sources: dandelions, blackberries, clover. The bees will focus on a favorite source until it’s exhausted, often flying past something closer to the hive. • In the winter, bees disconnect their muscles from their wings. This renders them unable to fly, but still able to vibrate their wings, in order to generate heat for the hive. • Bees prefer a small window of temperatures in the hive – from the mid- to high 90s – and they will fan their wings and cluster to keep the temperature constant, 24 hours a day, seven days a week, no matter if it is 100 or -10 degrees outside. • Once the queen lays an egg, it takes three days for it to hatch into a larva. 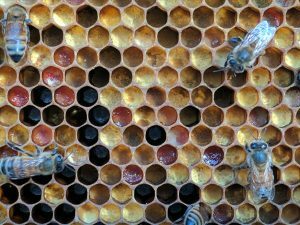 On day 21, a working bee emerges, and its first job is to clean its own cell. • The lifespan of a bee in the springtime is only a few weeks. • Bees use stored honey for food to sustain them through the winter. • There are three kinds of apiarists: hobbyist (own less than 100 hives), sideliner (100-300 hives) and commercial beekeeper (300+ hives). Bobby and Mac are hobbyists. • The answer to every beekeeping question is: “It depends.” Many factors affect a hive’s ability to thrive. Eating local honey often is acknowledged by health advocates as a good way to tackle seasonal allergies. It’s important to find a local beekeeper as a source for honey, since most grocery store honey is not local, and has been heated and filtered, removing valuable enzymes and nutrients. 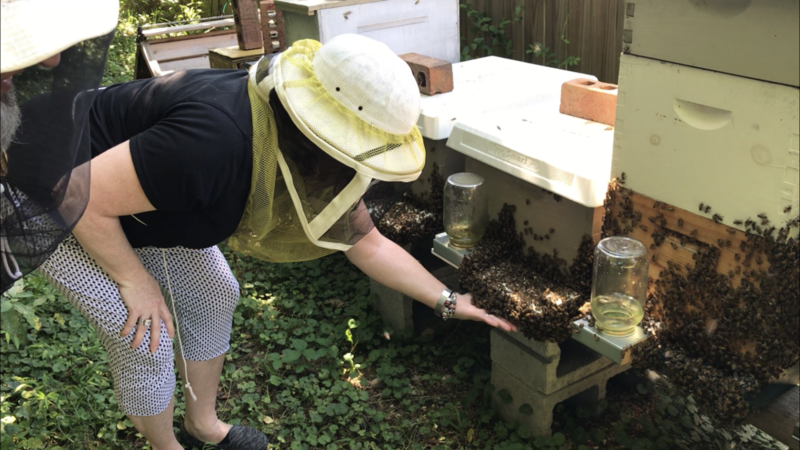 If you can’t be a beekeeper, there are ways you can assist the honeybee population: plant flowering trees and shrubs in your yard, avoid pesticides, don’t mow as often, allow clover and dandelions to grow. While some of these suggestions may not be popular with your homeowners association, you can plant a small section of wildflowers or try container gardening as an alternative. The owners of Bobbee MacBee’s showed Jackie how to safely hold bees in the palm of her hand.